Please note that the content of this book primarily consists of articles available from Wikipedia or other free sources online. 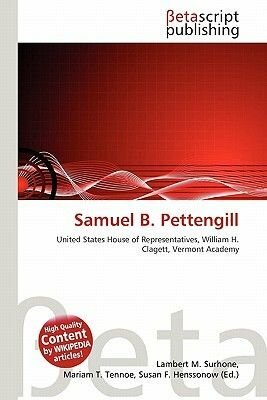 Samuel Barrett Pettengill (January 19, 1886 - March 20, 1974) was a U.S. Representative from Indiana, nephew of William Horace Clagett.Pettengill was born January 19, 1886 in Portland, Oregon. After his mother's death the family moved to Vermont in 1892, and settled on a farm in Grafton, Windham County. He attended the common schools. He graduated from Vermont Academy at Saxtons River in 1904, from Middlebury College, Middlebury, Vermont, in 1908, and from the law department of Yale University in 1911. He was admitted to the bar in 1912 and commenced practice in South Bend, Indiana. He served as member of the board of education of South Bend from 1926 to 1928.